As a caring business owner, you constantly go above and beyond for your employees. Whether that means helping them build on their current skill set or praising them after a job well-done, you understand your team is the company’s biggest asset. That gets us to our topic for the day — employee safety. Before we continue, think back to the last time employee safety crossed your mind. Last week? Last year? 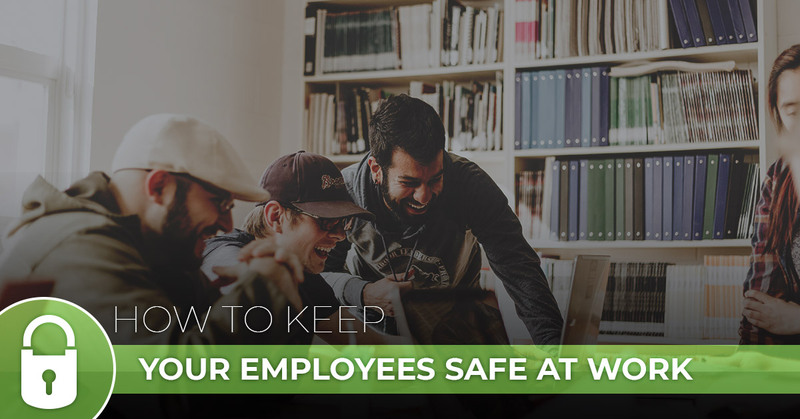 Whatever the case, it’s important to have the right security measures in place for your team. Sure, it’s definitely scary to play the “What If?” game. But in today’s world, it’s better to be prepared for something that never happens as opposed to the alternative. You hear it all the time after a tragedy: “I never thought it would happen here.” But the unfortunate reality is that acts of terror are taking place at workplaces more regularly these days. The person responsible could be a fellow employee or a complete stranger. It’s your duty as a business owner to think of all potential scenarios and take a proactive approach. Perpetrators rely on the element of surprise, which is why it’s so important to emphasize awareness within your team. If you notice suspicious behavior anywhere around your office, report it to the authorities. Who knows? This level of assertiveness could be what stops a potential tragedy in its tracks. Want to take your safety measures to the next level? Then we recommend teaming with local law enforcement officials. They can point your company in the right direction as far as courses are concerned and even provide training of their own. Don’t be afraid to search online for workplace safety experts, either. Now comes the most crucial part of the process. Work with your legal counsel in developing a plan that all employees understand. Ideally, this written plan of action should be included in your policies and procedures documentation. It’s one thing to have a local law enforcement official stop by the office and discuss safety precautions. Don’t stop there, though! Take the next step and come up with a concrete strategy for your company. As you can see, each of these ideas builds off the previous. Now that you have a set plan for an emergency situation, it’s time for the company to put it into action. So make the time at least twice a year (every six months) to practice for such a scenario. Obviously, give your employees plenty of notice and encourage them to ask questions following the drill. Depending on the size of your organization, it might be beneficial to name several leaders for a security threat. These volunteers can help coordinate and possibly take on additional responsibility in the event of an emergency. Remember that workplace safety should be a company-wide effort and not an individual thing. 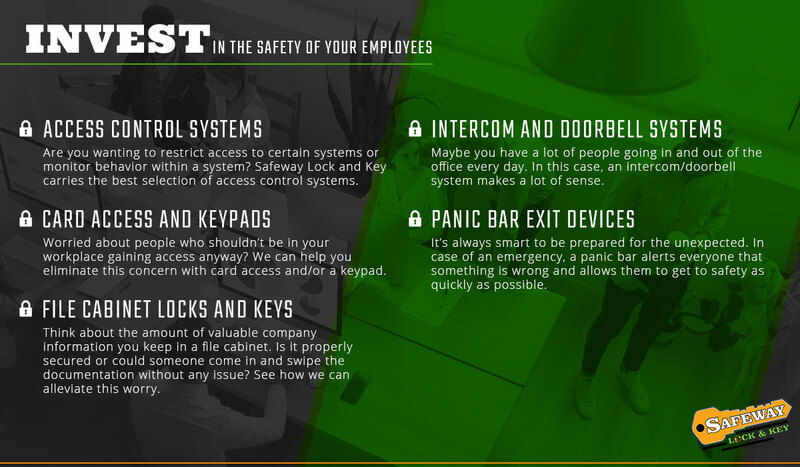 We’ve discussed a number of security ideas to implement at your workplace. 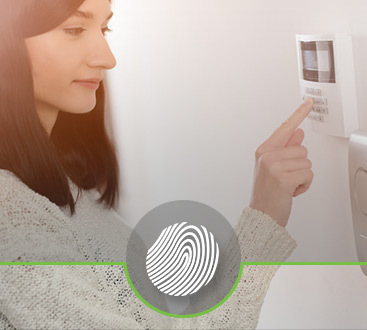 One final one we want to talk about is getting in touch with a commercial locksmith. More specifically, how can a locksmith such as Safeway Lock and Key improve a company’s security? Think of it this way: If a perpetrator is unable to gain access to a certain space, they’re in trouble. Chances are they’ll either be apprehended by someone or completely deterred. But for this to happen, the right security system must be in place. This is where the professionals at Safeway Lock and Key come into play. Simply come to us with your security concerns and we will get right to work developing a plan. 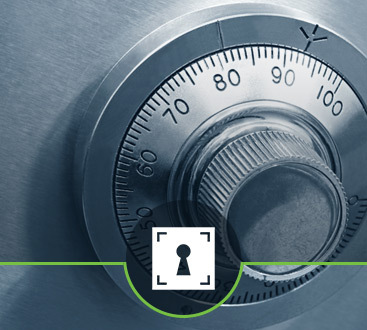 With Safeway Lock and Key, there is no “cookie-cutter” or “one-size-fits-all” mentality. You can count on us to customize a safety solution to meet the needs of you and your company. Part of what makes Safeway Lock and Key different is our emphasis on customer satisfaction. We always take pride in our work and pay attention to the smallest of details. See for yourself what makes us Baltimore’s No. 1 commercial locksmith. Contact us today!